Nature Hikes For Mental Health: What Are The Benefits? This entry was posted in Mental Health and tagged Managing Symptoms, Recovery, Treatment on September 22, 2016 by Team Addiction Hope. It’s well understood that the culture of our lives has changed at breakneck speed. One of the drawbacks of such a pace might be the sharp increase in mental health and anxiety disorders. Though technology isn’t all to blame, it has changed the way we live our lives to such a degree that time outdoors is no longer a necessity. For most of us, a major portion of our lives is spent inside, and our work almost exclusively involves watching and interacting with screens. Our mothers have been telling us to go outside and play for years. Now we know that not only was she right, but that such activity is also good for our minds and bodies. Recent studies at Stanford University have uncovered an interesting revelation regarding mom’s advice. The findings, published in Proceedings of the National Academy of Science, had to do with effects of nature on mental health. Researchers took control groups into different settings and monitored their brain activity as they navigated the area. Half of the participants were taken to a natural area such as a forest. They were free from the hustle and bustle of the city and given beautiful settings to enjoy. The other group of people walked through an urban area that was flooded with traffic and crowded walkways. Over the course of 90 minutes, these experiments showed great changes in the activity of the brain for the people who were taken to the natural trail when compared to those who were in the urban environment. In fact, the area of the brain responsible for creating feelings of depression was affected the most. To put it simply, researchers saw a positive transformation in the mental health of the group that spent time in the forest. It is worth noting that mental disorders have been rising rather rapidly in the last century, perhaps not coincidentally with urbanization rates. Statistics reveal that people who dwell in cities are more than 20 percent more likely to develop an anxiety disorder and are 40 percent more prone to experience mood disorders. As our population continues to urbanize, finding such outdoor retreats becomes more challenging. The numbers regarding urbanization and mental health are concerning, but if the Stanford study tells us anything, it’s that we should be consciously looking for ways to explore the outdoors. 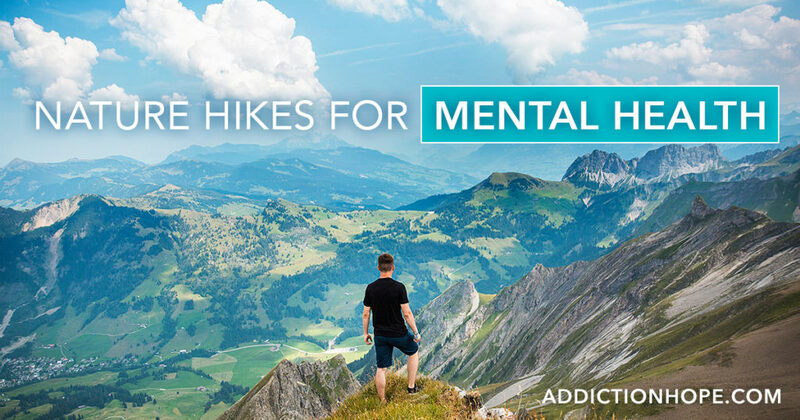 Hiking as an activity – which can be scaled depending on ability – can transform our mental health for the better. It’s astounding to consider that a simple walk through the woods has the power to fight depression and anxiety. Though it may not solve all the issues a person has, it’s a great avenue for dealing with challenges such as anxiety and depression. Improving physical condition: Hiking is a fantastic form of exercise. The varied terrain can often serve as cardio, strength and endurance training, all in one trip. Having a healthier body is an important part of keeping a healthy mind and vice versa. Adventuring into the woods is a wonderful way to work on both aspects of our health. Experiencing new things: A love for hiking can lead you to breathtaking heights all over the world, but it can also show you new sights and geological wonders right in your backyard. When hiking, you’re often forced to disconnect from technology and give nature your full attention. This opens the door to see some incredible flora and fauna during every adventure. Creating new relationships: Most of the time, people are passionate about their hobbies. If you begin hiking, it’s very likely that you’ll run across people with similar favorite activities. With that kind of common ground, you increase the chance of bumping into a new buddy and fellow enthusiast. Allowing better sleep: The physical demands of hiking will let your body rest more thoroughly and stay asleep throughout the night. It also naturally cuts back on stress levels, which can help quiet your mind when it’s time for rest. Mixed together, the benefits of hiking build on each other to create a stronger mental state. They’re relaxing, fun and usually free or inexpensive – and science has now proven that the activity is good for you.